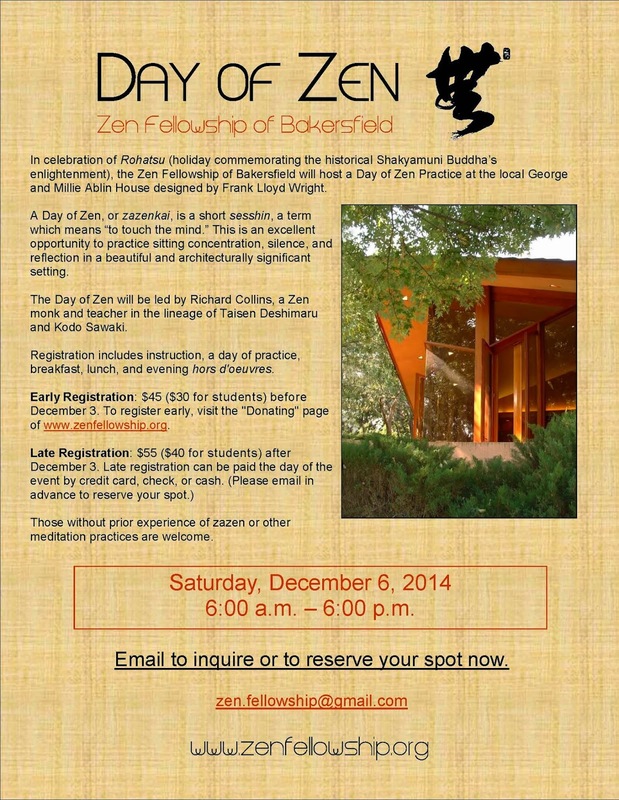 In celebration of Rohatsu (holiday commemorating the historical Shakyamuni Buddha’s enlightenment), the Zen Fellowship of Bakersfield will host a Day of Zen Practice at the local George and Millie Ablin House designed by Frank Lloyd Wright. A Day of Zen, or zazenkai, is a short sesshin, a term which means “to touch the mind.” This is an excellent opportunity to practice sitting concentration, silence, and reflection in a beautiful and architecturally significant setting. Registration includes instruction, a day of practice, breakfast, lunch, and evening hors d'oeuvres. Early Registration: $45 ($30 for students) before December 3. First, reserve your spot by emailing the retreat coordinator. Once you receive confirmation, you can prepay early registration by visiting the following registration page. Late Registration: $55 ($40 for students) after December 3. First, reserve your spot by emailing the retreat coordinator. Once you receive confirmation, you can pay the day of the event by credit card, check, or cash. Before you pay, remember to confirm your spot with the retreat coordinator. Once you have received confirmation, click the PayPal button below to pay. After the due date, regular registration is $55 and payable the day of the event via credit card, check, or cash. After the due date, student registration is $40 and payable the day of the event via credit card, check, or cash. Here and Now October 2014 has arrived. Click the link or image below to read and download this edition of the American Zen Association (AZA) newsletter. The AZA is the umbrella organization of sanghas established in the lineage of Robert Livingston Roshi, Abbot of the New Orleans Zen Temple. Founded in 1983, AZA is devoted to teaching Zen in the tradition of Taisen Deshimaru and Kodo Sawaki. In addition to Robert Livingston, teachers in this lineage are Tony Bland of the Mississippi and Alabama groups and Richard Collins of the Alexandria (Louisiana) and Bakersfield (California) groups.